Paddlers prepare to get back on the Susquehanna River on Saturday (top) after a hike to the Starrucca Viaduct (above), where the sojourners were dwarfed by the historic stone-arch railroad bridge, one of several highlights of a two-day, 15-mile paddle of the Great Bend area on July 28 and 29. 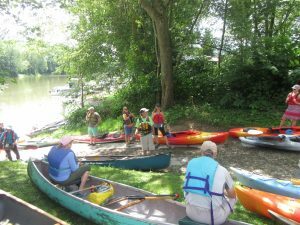 Two dozen paddlers set into the Susquehanna River just above the Pennsylvania/New York border on Saturday morning to kick off the two-day Exploring the Susquehanna’s Great Bend Sojourn that included history lessons, hikes, camping and camaraderie. 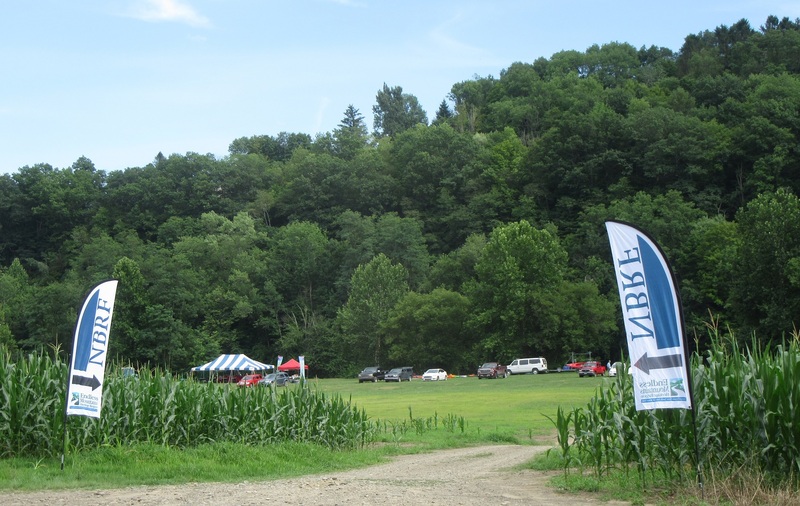 Beautiful weather prevailed for the duration of the event which, in itself, was a prelude to another celebration of the river planned for Friday to Sunday, Aug. 10 to 12. 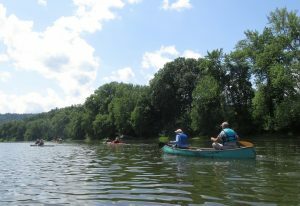 Recreational interest in one of the world’s oldest waterways continues to grow, and Susquehanna County residents like Dana Rockwell see great potential in the Great Bend. “We’re kind of the forgotten section of the North Branch,” Rockwell says of the 13 miles of the Susquehanna that dips into Pennsylvania from New York state before shifting back into New York and reentering Pennsylvania at Athens in Bradford County. 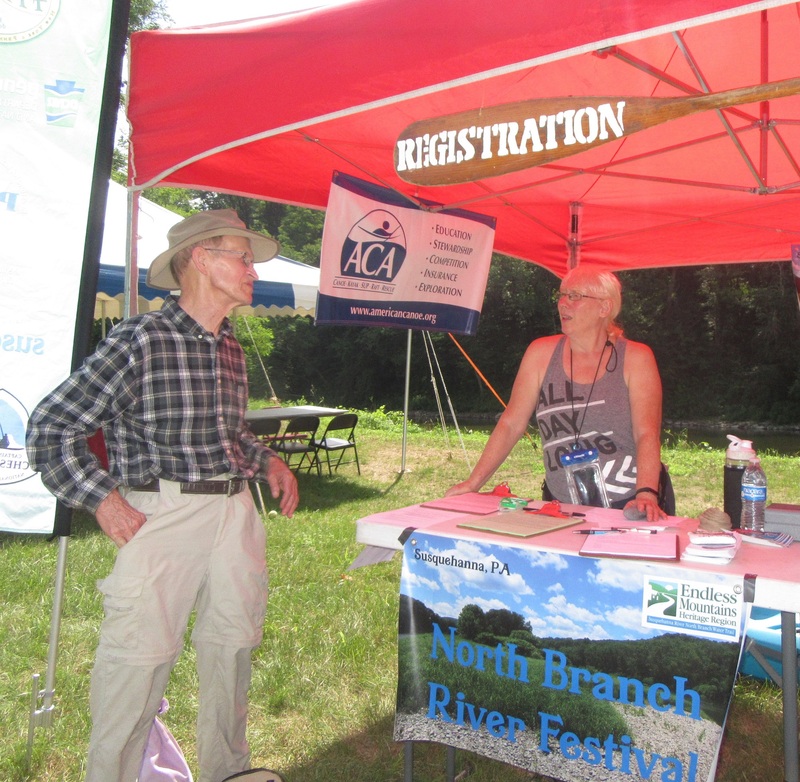 He collaborated with like-minded people to start the North Branch River Festival at Oakland in 2016 when the North Branch Susquehanna River was named River of the Year by the Pennsylvania Organization for Watersheds & Rivers (POWR). Rockwell maintains that the beauty and history of the Great Bend area is unique treasure to be shared by residents and visitors alike. “I like being hemmed in by forests from both sides of the river,” Charlie Yaple of Marathon, NY, remarked after the first day of paddling. “It was refreshing compared to other stretches of the river that I have kayaked.” Yaple paddled a canoe with Rockwell this past weekend and, as a professor at SUNY Cortland and author, served as one of the key speakers on Saturday evening, where the sojourners camped at Victory Park in Oakland Township. Saturday’s six and a half mile journey started at the Pinecrest Campground and ended at Victory Park (below), which is where the bulk of activities will be held for North Branch River Festival 2018. On the way there, Rockwell paused with his paddlers at the Cascade Creek delta to read passages from a journal written in 1791 detailing the old portage trail upstream from the river. At the mouth of Starrucca Creek, sojourners disembarked for a short hike across a farmer’s field to the Starrucca Viaduct. “The stop at the viaduct was worth the trip,” Yaple contended. Himself a writer of history books in his home state, he was enamored by the details of the construction in one year of the oldest stone arch railroad bridge in the United States (and perhaps the world) still used daily. At Victory Park, he and other guests thumbed through restored photos from the collection of Jon C. Burdick depicting Susquehanna Depot, Oakland, Lanesboro and Great Bend in their early days. On Saturday evening, Yaple spoke on the importance of the river to Native Americans and early European settlers. On Sunday morning, the entourage got back into their kayaks and canoes and continued town the river, stopping at the LDS Priesthood Restoration Site, gazing at rock outcrops used as lookout points for hundreds of years by Native Americans, and helping to remove tires and other garbage from an island near Great Bend. “We need to do this more. It’s wonderful,” said Susan Pratt of Montrose, who noted that she had not been on the river in a number of years. It was the first time that she and her husband, Kelly (below, foreground), had paddled the Great Bend stretch after seeing one of Rockwell’s posts on Facebook. For Jennifer Smith of Gouldsboro, the weekend adventure marked her first time on the river. She had previously only kayaked on lakes at state parks. The short stretch of rapids just above Victory Park was a welcome surprise to her. “That was very different,” she stated, “a little scary but exciting.” Smith was attracted to the sojourn, she related, for the opportunity to meet new people and learn about the history of the area. Rockwell also provided information about the 444 Club, named for the 444 miles of the North Branch and main stem of the Susquehanna from Cooperstown, NY to Havre de Grace, MD, where the river reaches the Chesapeake Bay. More than 50 people have been acknowledged for paddling the entire length, whether in segments or as a single journey as Rockwell and his friend, Peck Milbauer, did in 2017. Rockwell provided a powerpoint of photos of their adventure. Sandy Rinker of Springville and her nephew, Aaron Whitney of Binghamton, NY, are avid paddlers and both interested in obtaining their 444 Club certification through the Endless Mountains Heritage Region. 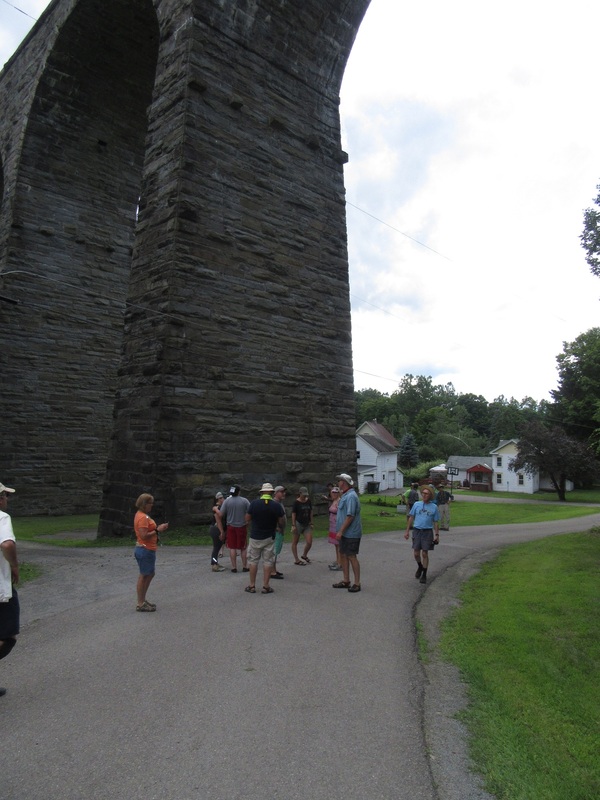 The weekend sojourn added 15 miles and closed a gap for numerous participants. 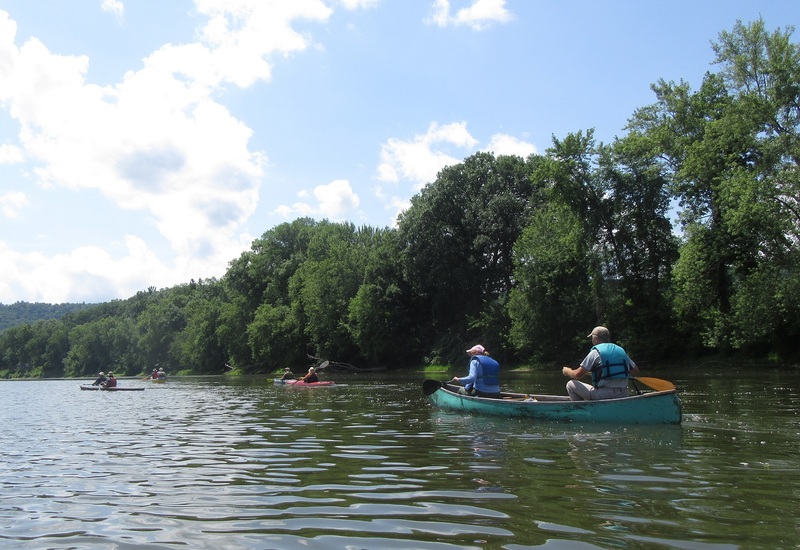 “I just love to be on the water,” Rinker remarked, noting she has paddled the stretch of the Susquehanna River from Laceyville to Falls in Wyoming County several times. 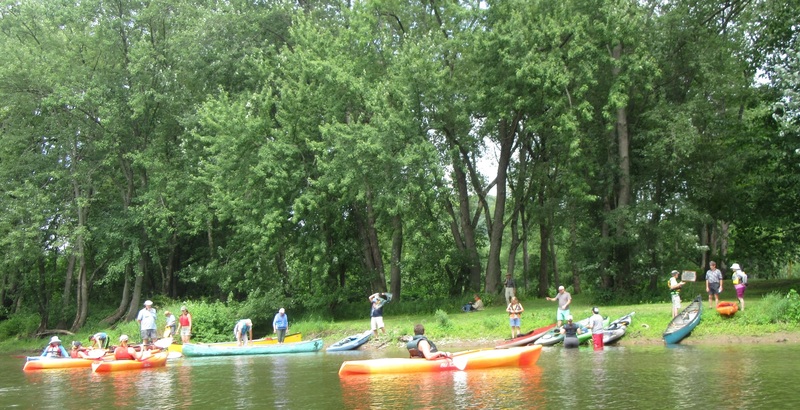 Highlights of the North Branch River Festival, Aug. 10 to 12, include a variety of kayak and canoe races and a family friendly float from Pinecrest Campground to Victory Park on Sunday. The event will feature live music, numerous food vendors, and exhibits celebrating the rich history of the river towns of Susquehanna County. For more information and to download race and float registration forms, follow North Branch River Festival 2018 on Facebook. 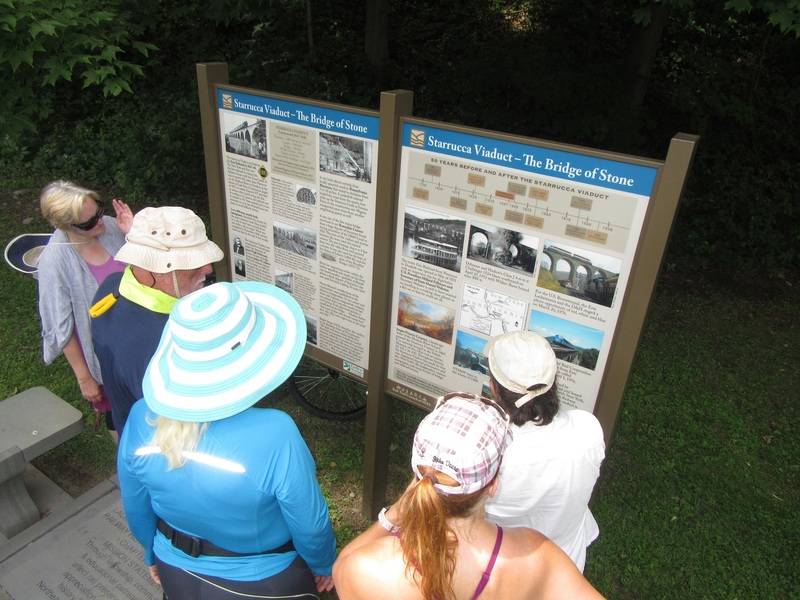 Sojourners take in the history of the massive stone arch bridge at Lanesboro that passes over the Starrucca Creek. 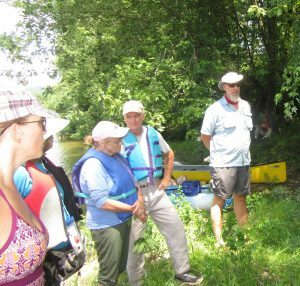 Sojourn guide Dana Rockwell (right) shares some history about the early settlement of Harmony at the mouth of Cascade Creek. SUNY Cortland professor Charlie Yaple (left) and Wanda Rockwell greeted sojourners on Saturday morning at the registration tent at Victory Park. Rick Shumaker (center) provides a safety talk for kayakers before they launch onto the Susquehanna River.